Hello my lovelies, a very Merry Christmas to all of you’ll have a fabulous festive week ahead. I’m gearing up for tonight’s family Christmas Celebrations and can’t wait for the grand feast, wine,sweets, exchange of gifts and some crazy dancing. 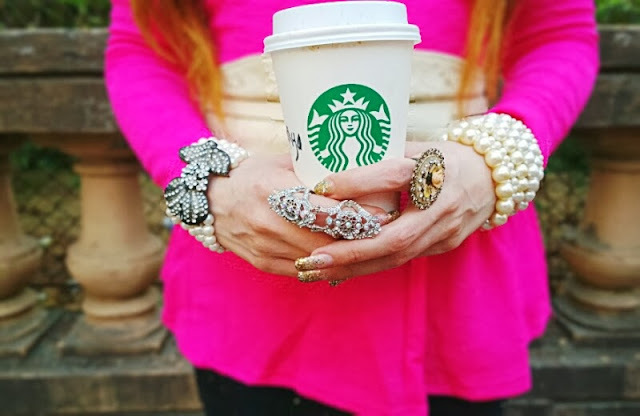 My look today is a combination of two glamorous and hot trends this winter season Pink + Sequin. Pink hues are huge this season, the designers took over the catwalks with this colour and now you need to add to your winter wardrobe. 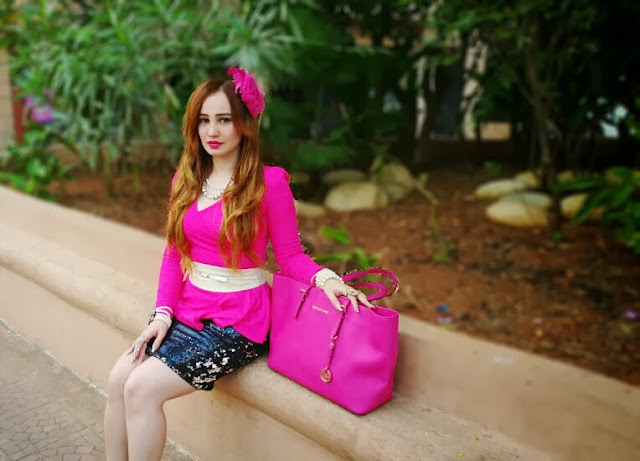 Pink hues are feminine, flattering and they are extremely beautiful. Pink is the new Black! Autumn/Winter is borrowing one of spring’s stellar shades: pink. 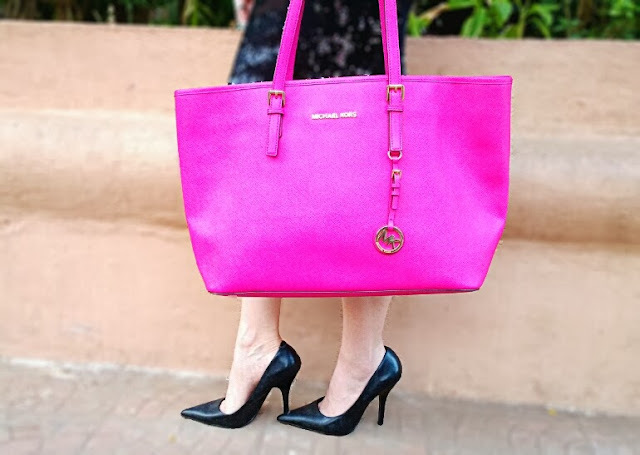 So embrace it, and make pink a power hue for a new season ! 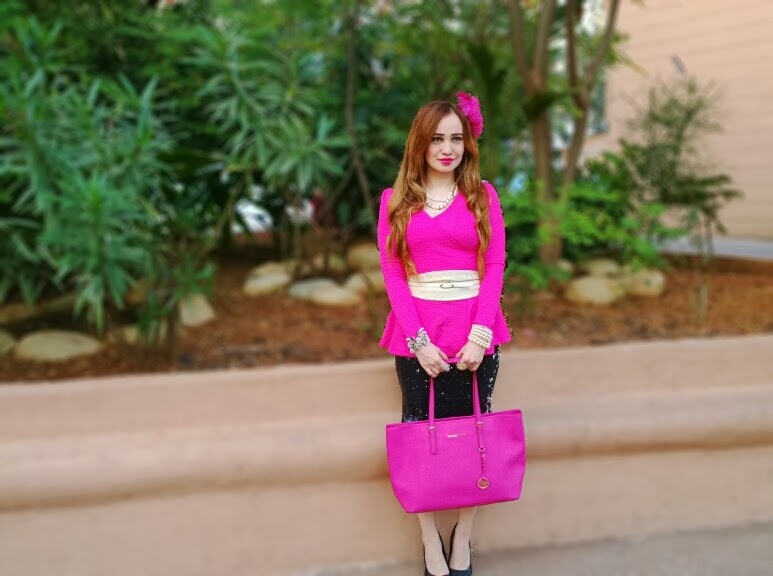 I choose a bold bright hue of pink for today’s outfit. Sequin too is a favourite Fall/Winter trend and is the perfect way to add that extra sparkle to an evening look. 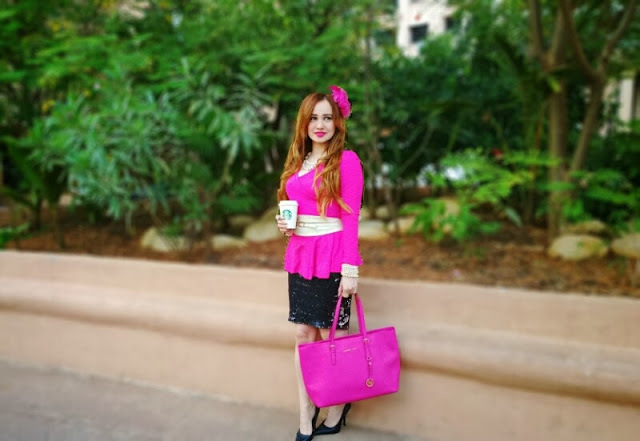 Today’s outfit post is a combination of this bubblegum pink peplum full sleeve top I received from the super fashionable Sammy Dress with this black & silver knee-length Zara sequin pencil skirt. Sammy Dress is an online store full of beautiful pieces with super affordable prices. Like the pretty top I’m wearing, you can get yourself a wide variety of super chic tops from Sammy Dress too. I was going for a very elegant ladylike look here so I accessorized with a off white lace belt, some pretty pearl jewelry, a stunning crystal ring and a matching pink headpiece. 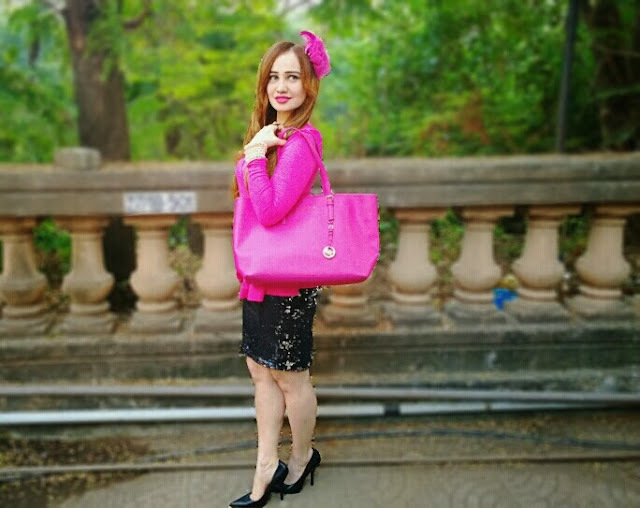 The highlight of the look, was the addition of my new Michael Kors Pink Jet Set tote that went perfectly with the peplum top. I finished of the look with elegant black pointed toe shoes. My favorite color and you look beautiful in it. Lovely in hot pink! Merry Christmas! 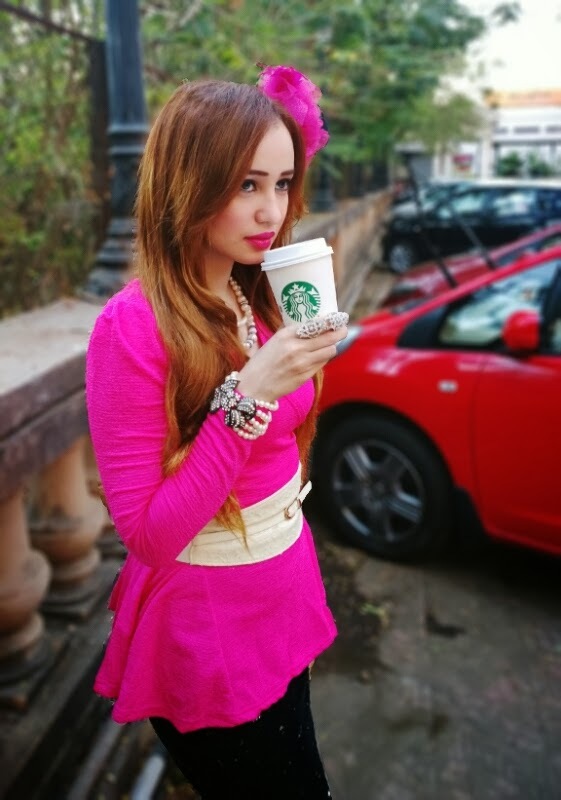 U look fantastic, I loved the hot pink on you..
u look amazing in pink! What a cute pink ! Amazing look! I love pink color! You look perfect from head to toe, love everything! Oh wow, amazing, matching pops of pink! You look gorgeous , i'm loving your bag. The sequin style was truly trending during the Christmas Holidays and you nailed this look. By the way , i love the layout of you blog title. Wow..Nice combination. College students prefer shopping online salwar kameez since it reduces the efforts of visiting shops. They prefer Salwar kameez online shop.